Skoda Rapid Monte Carlo 2016 is a small wagon brought by one of most ‘Euro’ of European small carts, fast Spaceback Skoda. It is model inspired by the Subaru, which is late 1990s and early 2000s with the Impreza hatch. It was first confirmed for our market back in July 2015, the Skoda Rapid Spaceback tested here is the flagship Monte Carlo (named for the iconic rally that dates back to 1911). The Rapid Monte Carlo is available in two guises: one manual, one automatic. 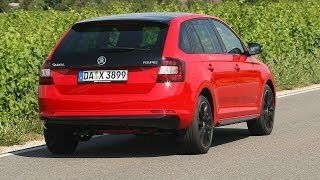 Let us have a close look at the reviews of the small wagon Skoda Rapid Monte Carlo 2016 and get to know more about the adorable model. 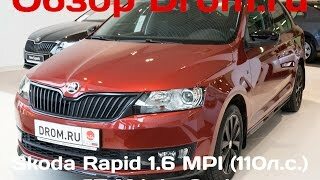 Skoda Rapid Monte Carlo 2016 is enhanced with beautiful interior. It has a red-stitched, predominantly perforated, leather-appointed flat-bottom sports steering wheel which feels nice in the hands. In addition there is a gear selector and manual handbrake and neat looking sports alloy pedals at your feet. It is aided with elements like little rubbish bins tucked into the decently-sized door pockets, a specific phone holder, and mini seat pockets on the inner shoulder flanks of both driver and front passenger seat which continue to be clever inclusions. Talking about the technology, there is nicely damped indicator and wiper stalks, simple climate and stereo controls and some lashings of chrome. These all features contribute in making the interior of Rapid Monte Carlo adorable. 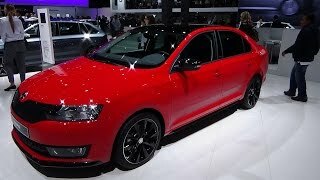 The exterior of Skoda Rapid Monte Carlo 2016 is upgraded and more enhanced. The standard upgrades in the front includes automatic Xenon headlights, fog lights with cornering function, rain-sensing wipers, cruise control, hill-hold assist, and a panoramic glass roof. In addition there is a carbonfibre-look dashboard insert, black 17-inch alloy wheels, and a black grille, front lip, side skirts, rear spoiler, rear diffuser and heated side mirrors. There is a rear privacy glass with parking sensors, rear spoiler, and rear diffuser. In all, the exterior of Rapid Monte Carlo is stunning with awesome gestures. Skoda Rapid Monte Carlo 2016 is powered with 1.4-litre Euro 6-compliant turbo-four cylinder engine with six-speed manual transmission. The output power generated is 123 hp. Monte Carlo is available in two guises: one manual, one automatic. It also provide with the additional equipment, with a larger capacity engine buddied up to seven-speed DSG dual-clutch automatic.